Two important statistics help frame any discussion about food waste: 1.3 metric gigatons of edible food goes to waste every year and at least 795 million people are undernourished worldwide. These numbers are nearly impossible to envision, but the general takeaway is this: as millions go hungry, we continue to waste perfectly good food on an enormous scale. The issue goes beyond hunger: Producing the food we waste takes land, water, labor and other valuable resources. To add insult to injury, food waste is a major source of greenhouse gases, mostly in the form of methane, a pollutant at least 25 times more potent than carbon dioxide. When we talk about climate pollution, we tend to focus on power plants, transportation and industry. If we think about food at all, it’s generally cows and their – ahem – “emissions.” Wasted food often gets overlooked, but according to an assessment by the UN Food and Agriculture Organization (FAO), 6.7 percent of all global greenhouse gases come from food waste. How big is the problem of food waste? If 6.7 percent sounds small, here’s one way to put it into perspective. Imagine that all the world’s food waste came together to form a country. It wouldn’t be a very popular country to live in, but it would have an outsize impact on everyone else: the nation of, Food Waste would be the third largest emitter of greenhouse gases, behind China and the U.S.
Just how big is the country of Food Waste? According to the FAO, the land devoted to producing wasted food is roughly 5.4 million square miles, which would make it the second largest country in the world behind Russia. That’s an area equivalent to Central America, Mexico, plus the lower 48 states and a big part of Canada used for nothing but producing food we don’t eat. 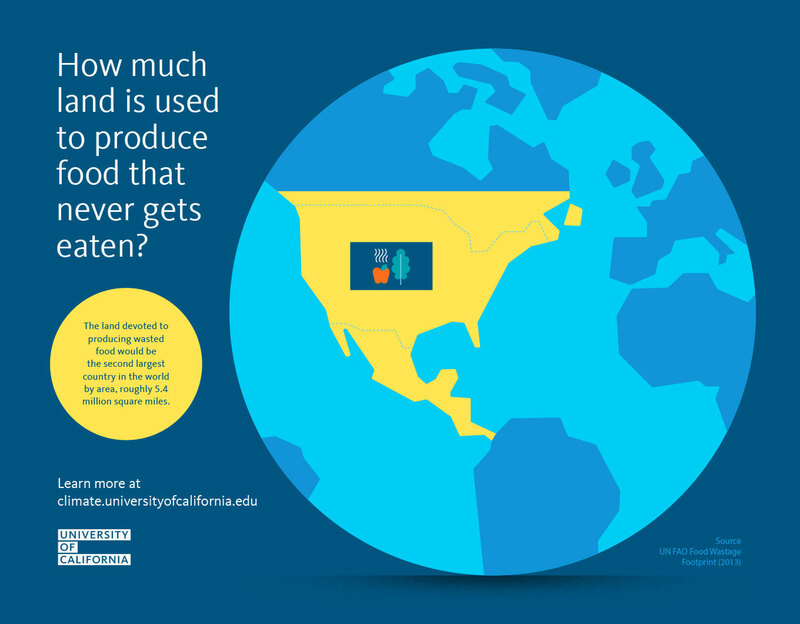 Where is food waste coming from? While thinking about food waste as a country helps size up a hard-to-conceptualize problem, it’s not entirely fair: Every country in the world contributes to food waste, some more than others. Globally, roughly half of food waste is created before the food leaves the farm, while the other half happens during processing, distribution and consumption. In developing countries, more waste happens on the farm and in distribution, while in developed countries, the pattern flips, with more waste happening at the retail and consumer level. An analysis of food waste in the U.S. by ReFED found that nearly 85 percent of waste occurs in stores, restaurants and homes. Food waste happens at every stage, from farm to plate, though the mix of culprits varies region by region, from poor access to proper refrigeration or food labels that encourage wasteful behavior. Food waste isn’t simply a problem associated with wealth and abundance; Poor infrastructure, inefficient agricultural systems and regional reliance on specific crops also contribute, making food waste a truly global problem. Which foods have the biggest footprint? 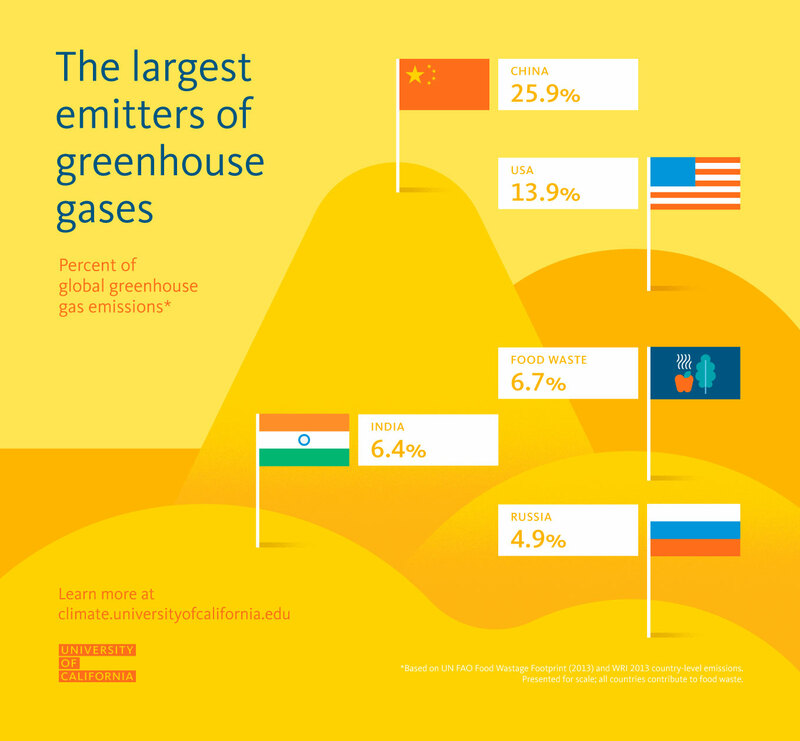 In general, plant-based foods are far less greenhouse-gas-intensive than meats — that is, if you have a pound of decomposing fruit and a pound of rotting meat, the meat will produce more greenhouse gases. This pattern holds true even when compared per unit of protein. Overall, because of the scale of their production, grains produce both the most waste and the most greenhouse gas emissions. Relatively little meat is wasted worldwide, but even small amounts of meat waste produce large amounts of greenhouse gases. 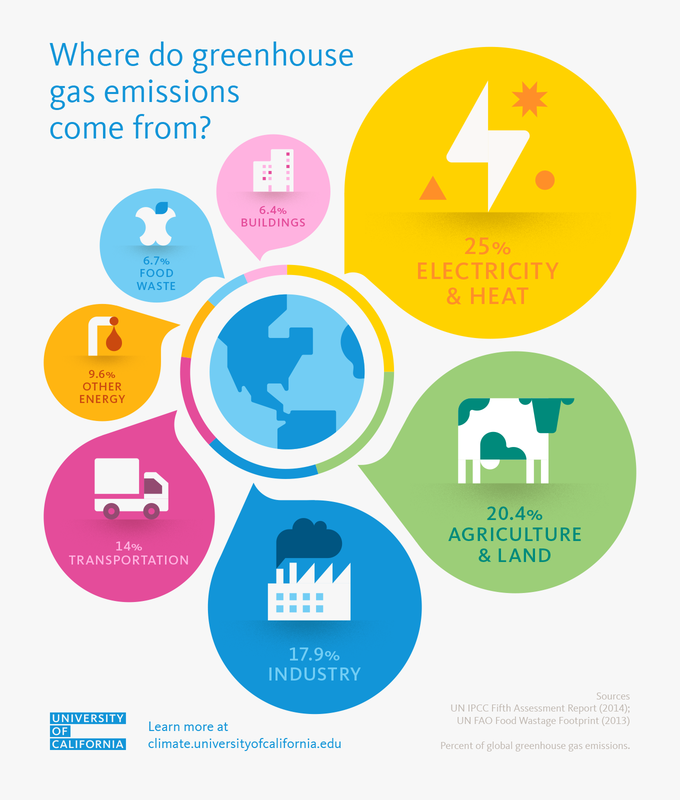 Even among meats and dairy products, there is quite a bit of variation in levels of impact: Emissions are highest for beef and lamb, but much lower for pork, chicken, eggs and dairy. It’s not all bad news when it comes to food waste. Among the causes of climate change, food waste is perhaps the easiest to deal with and the one where everyone can make an impact in their daily lives. On a personal level, we can save money and reduce our climate impact by planning meals and only buying food we know we are going to eat. Reducing meat intake and buying local produce can also help reduce our carbon footprint. Portion size control is not only helpful for health reasons, it can also reduce waste. Toss uneaten leftovers and other spoiled food into the compost bin or use your city’s green waste program, if it’s available. Policymakers in the U.S. are currently working on new guidelines for food labels to help consumers reduce waste (read more about the new food labels here). Watch below to see how researchers and entrepreneurs are taking on food waste to help the climate and get food to the people that need it.